It's still more expensive to buy homeowners insurance in Florida than anywhere else in the country. In fact, Florida homeowners are now paying more than double the national average. Average insurance premiums statewide for the most common type of homeowners policy rose nearly 8 percent in 2012 to $2,084, according to data released this week from the National Association of Insurance Commissioners. That makes Florida the first state to cross the $2,000 mark in average premiums and widens the gap between the next two states on the list, both of them coastal: Louisiana (average premiums of $1,742) and Texas ($1,661). The national average: $1,034. For the record, Florida's premiums are 102 percent higher. average premiums for homeowners insurance policies. 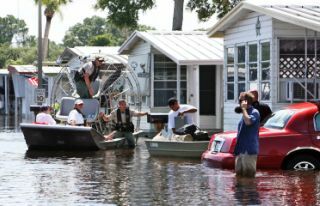 eligibility for sinkhole insurance, and what turned into the ninth-straight hurricane-free year. Still, even for homeowners used to paying higher rates, the numbers are a shocking wake-up call. remained No. 1 but that it widened the gap between fellow hurricane-susceptible Louisiana. He suspected some price gouging by reinsurers, who provide insurance companies an extra layer of coverage to pay for claims after a catastrophe. Within Florida, Hunter said, the cost to property owners varies to a wide degree. at-risk place in the country." "Your rates would have been much higher if the state didn't act in 2006," he said. "It's bad, but it could have been a lot worse." $2,084 Average insurance premiums in Florida for the most common type of homeowners policy. $1,034 Average insurance premiums in the United States for the most common type of homeowners policy.